The healthcare industry today is all business, which makes it even more important that you have the right financial partner on your side. At Siebert & Reynolds CPAs, a CPA serving the needs of doctors and physicians, we realize that our clients have specific tax and financial needs so we have assembled a dedicated team ready to assist with managing all aspects of your practice. We not only understand how medical practices operate, but we understand the key issues facing your industry. Through dependable and accurate financial reporting, we can help you make better management decisions. As a full-service Certified Public Accounting (CPA) firm, we provide a wide range of accounting, tax planning, wealth management and financial consulting services to meet the needs of doctors and physicians. 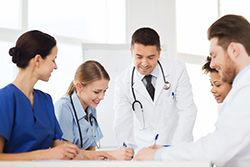 We work with doctor and physician practices of all sizes and specialties from sole practitioners to large medical groups. We pride ourselves on providing services designed to simplify the business side of your practice so you can address the more important issues: your patients. Call us today at 614-367-7850 to discuss your business needs with an experienced healthcare CPA serving the needs of doctors, physicians groups and other healthcare providers. Or, request a consultation online.